To soar high in the corporate world and to have a good graph of development, taking pride in your work is a necessary thing to do. Taking pride in your own work should not be mistaken for as selfishness. The main purpose to take pride in your work is to strive for the best among the crowd and give your all in any tasks that are given to you. Taking ownership also can lead to an increase in value for you as an employee and can be seen as an asset to the company. But in these years, due to the rapid growth in technology and the economy, employees are made to believe that quantity is more important than quality. This prevents them from creating high-quality products and services. Products are made cheaply and are made to be replaced frequently. Taking pride in one’s work gives priority to the quality first and then the result. Sadly, in recent years companies discourage this among employees by constricting them with tedious amounts of work to be completed under a deadline. Taking pride and ownership in your own work means, thinking back about the various achievements or qualities that you have received during work and stating it to a third person. 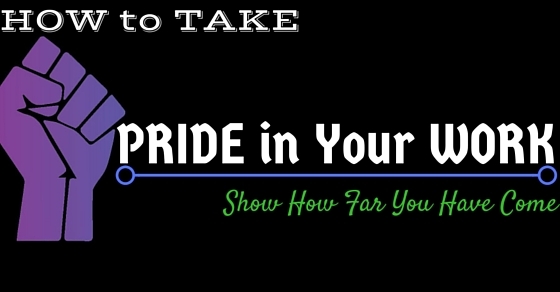 Taking pride at work also includes all the accomplishments that you have done by yourself. Your actions alone guarantee your happiness and your actions and hard work are responsible for yourself. Moreover, this also shows how confident you are about your work and how well prepared you are for future obstacles and difficulties. This also shows how well the employee is honoured at work and is eager to get the job done. Just keep in mind that the end product is a reflection of our personality, skills, and hard work and this gives a basic right to take ownership of the work we have done and present it to the others. This makes us more stand out from the generic crowd and people can recognize us by one’s work rather than the person’s status. Always try to remember that whatever work that you do, be it a small or a large type of work always have your name on it. This can be either in the form of a physical signature, watermarks, through initials, passwords etc. This prevents others from taking the limelight and attention from your work. If you are a person who is not bothered by the recognition and reputation, then it is fine. The main reason is because, your work passes through the hands of many people, thus your work is prone to theft or plagiarism. To prevent this it is necessary to have some kind of name on it so that you could identify your work easily. Try to build a good reputation by having a constant record of stellar performance. Try to always produce the best results as much as possible. This can build your reputation within the workforce as an ideal employee. This can make you be more noticed and recognized among the higher ups and the supervisors. This means more promotions, increments, and incentives. Try to have an impeccable record of good and satisfactory work. Always try to remember that each and every one of us has an important role in the organization. Even if it is a small role, try to enjoy and find the meaning in what you do. Try to keep in mind, each role has a purpose behind it. Try to find the purpose of the role that you do. For example, the janitors and the cleaners have an role in keeping the organization clean. If the janitor had not done his job properly, then it would have led to various problems and would have caused inconvenience to a large number of people. Do not be discouraged by how small the role is within the organization. As a working individual, always try to know about things that you don’t know of. Then, try to learn from that and slowly improve by yourself. Someone who constantly improves in their fieldwork is more likely to take claim of their own work. Moreover, most people will acknowledge it because they know that you have the deserved skill set and confidence. Try to improve the quality of the knowledge that you already have. This can either be in the form of experience or an acquired knowledge. Also, keep in mind that the acquired skills and experience within each person is different. This makes the work done between two individuals unique and different. This should be the factor that makes you stand out in a crowd. Do not try to do work in a generic way. Try to add your personality and style into your work. Try to build and develop a sense of trust among your colleagues and fellow peers. Gaining a considerate amount of trust means that you will feel more confident about your work and will feel more determined to get the work done so as not to disappoint others. This is really important if you are working in a group. Moreover, people will be more confident in you and will believe that you will be able to give out a good performance. A sense of confidence will help you spur to take pride in your work. Be true and be aware of what can be completed, how and when it can be completed. Try to be realistic with the situation. In an organization, the workplace contains many issues such as political agendas, issues related to resources, delayed decisions and results and all. Your resourcefulness should be a factor to help you tackle all these work related problems in the company. Do not feel defeated by the hard and external obstacles that you will face while doing a job. The best method is to do your work with pride and face these obstacles head on. All the rest of the things will fall into its place. Eventually, the rest of the problems will sort out by itself. Taking pride in work not only changes the atmosphere of your workplace but also makes you feel a bit more happy and relaxed at work. You will feel more energetic and happy to do work. This will create a positive environment for you and your fellow colleagues. In this manner, you are not only influencing yourself but also influencing others. This way you can enjoy your work more. Consider your skills, knowledge, and power and try to think whether you have applied these factors to your work properly. This is because all your qualities were evaluated by higher ups before accepting you for the job. So, try to think whether you have met the expectations and the needs of your employer or the organization. If not, then you have a self-defeating attitude. This should not be taken as an excuse when it comes to work. Always try to improve yourself and this, in turn, will help you in building a strong sense of pride in your work and makes you feel more confident in your abilities, personality, and skills that you have. At the end of the day, the main question that arises is that how well you have spent your time and how well did you do in your work. Try to give your all in a job given to you, and this will give you a sense of accomplishment and happiness. This, in turn, will give you a chance to feel more confident about your work and your work will also be seen as an example for others. As an employee, who is working in a specific position, you have the responsibility to do well in that specific job. This is necessary because, in an organization, you are responsible for your own actions. So you owe yourself to become more productive and be an asset to the company. This is where time management is involved. Showing pride in your work does not mean impressing the supervisors, managers and the higher ups. It is about showing your support in the decisions that you made and also to show the amount of hard work that you have done to achieve this. Try to emulate qualities of you to others, so that you can be seen as a valuable employee in the company. There is no discrimination of recognition for anyone who values their work honestly and with loyalty. Be it a small or a large work, anyone who does their job properly and values the importance of time, surely will get recognized. Try to understand what employers and supervisors try to look in their staff. Most of them want reliable and trustworthy people, who always work hard and bring the desired results that they want. But how does this help for a working individual? When you are someone who takes pride in your work, regardless of the job, you find the job to be really important and give the most priority to the job that you are working on. Thus, this will also affect the results that you produce and you will be able to produce more likable outputs. On the surface, it seems that supervisors are serious about the job but in reality, the results depend on how serious you take yourself and how much priority you give to your work. The results can be drastically be seen as how well you do your work and how well do you consider your job. Exceptional results will be produced irrespective of your skills and abilities. How to Show Pride in the Work You do? 1. Try to be happy when serving for customers. Do not discriminate customers based on their behavior. Try to be equal to all the customers. Think of this as an opportunity to showcase your abilities to them. 2. Do not just simply complete a job. Try to make it as an experience, both for the customer and the employee. A proud employee tries to take a step further, makes the given task worth experiencing. 3. A proud employee does not blame others for his or her own incompetence. On the other hand, they try to take responsibility for the problem and tries to solve it. They feel that they should be a part of this and tries to reach to an optimum result. They try whatever they can to resolve the issue. Moreover, they genuinely care so much about the issue that they feel really uncomfortable, if not solved properly. 4. Proud employees know that they represent the organization and so, they try hard to represent in a positive manner. They don’t try to ignore the problem or toss it to others. They give priority to the problem and tries to solve this as fast as they could. 5. Proud employees have a lot to tell about their experience in working and stating what all work they did. They try to be specific about the kind of work they did and how they did. They are not boastful in their work but they are confident in presenting their work to others. This gives them a sense of accomplishment and confidence which is necessary to strive forward in a competitive industry. Moreover, they don’t just simply state their job duties, they also describe how well they applied their skills in the work that they do and how it has been beneficial to them and to the customers.